1. What are the different types of transmission lines? they are called as distributed elements. They are also called as primary constants. 5. Give the general equations of a transmission line. Y = G + j ωC = shunt admittance, mhos per unit length of line. radians is called a wavelength. 7. What is the relationship between characteristic impedance and propagation constant? 8. What is meant by distortion less line? constant and velocity of propagation cannot be functions of frequency. whose   8.8810048.1 4X . variation is known as frequency distortion. 12. Define delay or phase distortion. known as delay or phase distortion. 13. How can you reduce frequency distortion? over-all uniform frequency response over the desired frequency band. 14. How can you overcome delay distortion? spacers. The velocity of propagation is raised and made more nearly equal for all frequencies. 15. Give the expressions for attenuation constant, phase constant and velocity of propagation in a telephone cable. is equal to the characteristic impedance (Zs=Z0). 18. What is an infinite line? 19. What is a distortion less line? What is the condition for a distortion less line? a) The attenuation constant α should be made independent of frequency. b) The phase constant β should be made dependent of frequency. d) The velocity of propagation is independent of frequency. 21. What are the types of loading? 22. What is continuous loading? core or a magnetic tape over the conductor of the line. 23. What is patch loading? of unloaded cables which increases the inductance value. 24. What is lumped loading? inductors at specific intervals along the line, which avoids the distortion. load under image matched conditions would exceed the current actually flowing in the load. 26. What do you mean by reflection factor? 27. 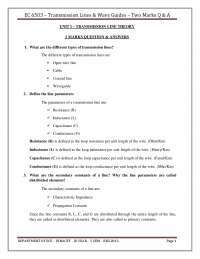 Define insertion loss of a line. which the current in the load is changed by the insertion. 28. What are the primary constants of a transmission line? henry/unit length, capacitance C, farad/unit length and conductance G, mho/unit length. 29. What are the secondary constants of a transmission line? 30. A transmission line has  12745oZ ohms and is terminated by 100RZ ohms. Calculate the reflection loss in dB. 31. When does a finite line appear as an infinite line? to the sending end generator as an infinite line. 32. 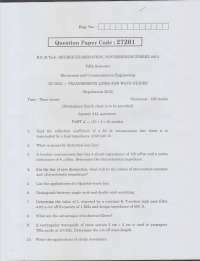 Write the equation for the input impedance of a transmission line. side of the transmission line provided the line is properly terminated. load impedance of (650 – j475) ohms. Determine the reflection coefficient. 1. 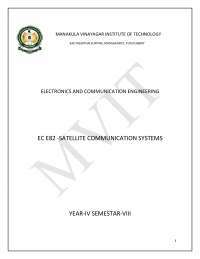 State the assumptions for the analysis of the performance of the radio frequency line. conductor. The internal inductance is zero. 2. What is called a line of small dissipation and a line of zero dissipation? as in transmission of power at high efficiency. 3. State the expressions for inductance L of a open wire line and coaxial line. 5. What is dissipationless line? 6. What is the nature and value of Z0 for the dissipation less line? 7. State the values of α and β for the dissipation less line. 8. What are nodes and antinodes on a line? 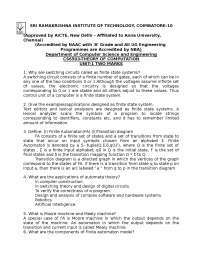 are called antinodes or loops. 9. What is the range of values of standing wave ratio? The range of values of standing wave ratio is theoretically 1 to infinity. 10. State the relation between standing wave ratio and reflection coefficient. 11. What is standing wave ratio? 12. What are standing waves? 13. State the relation between standing wave ratio S and reflection co-efficient k.
14. How will you make standing wave measurements on coaxial lines? 15. Name the devices used for the measurement of standing waves. 16. Give the expression for the input impedance of the dissipation less line. line is frequently called the reflection coefficient.  = and   CjLj   = LCj . 22. Give the minimum and maximum value of SWR and reflection co-efficient. C = 16pico farad/m working at radio frequencies. L Z o  = 866 ohms. 1. What is Impedance Matching? transmitted from the source will not reach the load end and hence some power is wasted. 2. State the uses of the eighth wave line. equal to Ro of the line. 3. State the uses of the quarter wave line.  It may be used to couple a transmission line to a resistive load such as an antenna. coaxial line Such lines are sometimes referred to as copper insulators. 4. What is an impedance inverter? transform low impedance into high impedance and vice versa. 5. State the uses of half wave line.  A half wave line may be considered as a one – to – one transformer. 6. Mention the applications of Smith Chart.  to determine the sending end impedance. 7. 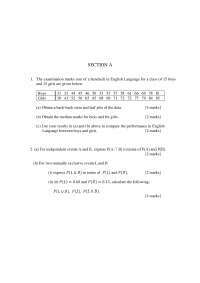 Explain impendence matching using stub. resonant resistance equal to Ro. 8. What are the properties of Smith Chart?  Determination of reflection co-efficient K in magnitude and direction.  Location of voltage maxima and voltage minima.  Movement along the periphery of the chart. high impedance and vice versa. 12. Give the formula to calculate the length of the short circuited stub. 13. 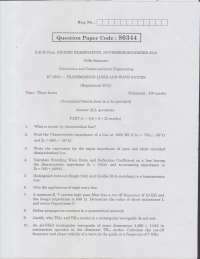 What is the input impendence equation of dissipation less line? 14. Give the equation for the radius of a circle diagram. Where C is the shift of the center of the circle on the positive Ra axis. 15. What is the use of a circle diagram? lengths determined by the intersections of the corresponding βs circles with the vertical axis. circles with the vertical axis. 17. What are the difficulties in single stub matching? place from a mechanical view point. these being location and length of the stub. 18. What is double stub matching? locations of the stub are arbitrary, the two stub lengths furnishing the required adjustments. The spacing is frequently made λ/4.This is called double stub matching. 19. Why Double stub matching is preferred over single stub matching. location of single stub will have to be changed. 2. The single stub matching system is based on the measurement of voltage minimum. 1. For a symmetrical network, define propagation constant and characteristic impedance. the image impedance is then called the characteristic impedance or the iterative impedance, Zo. impedance transformation ratio is unity. 2. What is constant k network? 3. How to obtain constant-k high pass filter? a constant independent of frequency. 4. What are the demerits of constant – k filters? impedance match is not possible. 5. What are m-derived filters? The m-derived filters attempt to raise the attenuation near cutoff frequencies. the decibel, abbreviated “db” defined as db = 10 log(P1/P2). 8. Write down the relationship between neper and dB. 1 Neper = 0.115 dB. 9. What do you mean by symmetrical networks? arms of a π network are equal, the networks are said to be symmetrical. 10. What are called cut-off frequencies in the design of filters? vice versa, are called cutoff frequencies. 11. What is meant by the terms pass band and stop band as applied to filters? the attenuation of the signal is zero for an ideal filter. where the attenuation of the signal is infinity for an ideal filter. 12. What is the use of crystal filters? circuits, in the range above 50 kilocycles. 13. What are the characteristics of an ideal filter? attenuation in the stop band. and cut-off frequency is 2000HZ. and cut-off frequency is 1000HZ. 17. What are composite filters? results in a composite filter. 18. How can you realize a band stop filter? that of a high pass filter. 19. How do you obtain a band pass filter? the high pass filter, the overlap thus allowing only a band of frequencies to pass. 20. Give the characteristic impedance of constant k low pass filter (both pi and T sections). UHF), signal analyzers for test and measurement and also radar systems for navigation. 22. Give some applications of filters. 24. Give the expression to determine the propagation constant of a symmetrical T network. band are appreciably attenuated with respect to frequencies just inside the pass band. 1. What are guided waves? Give examples. 2. What is E wave or TM wave? strength Hz in the same direction. 3. Define H wave or TE wave. strength Ez in the same direction. transverse entirely but have no components of Ez and Hz. It is referred to as principal wave.  TEM waves are special type of TM wave.  It does not have either Ez or Hz component.  Its velocity is independent of frequency and its cut-off frequency is zero. 6. What is known as cut-off frequency? The frequency at which the wave motion ceases is called the cut-off frequency of the waveguide. 9. Write down the expression for the wave impedance for TM, TE and TEM wave. 10. Write down the expression for cut-off frequency? 13. Write the relation between group velocity and phase velocity. VgVp = C 2 , where C = velocity of light. 5000MHZ with the TM1 mode excited, find the cut-off frequency. GHZ with TM2 mode being excited, find the cut-off wavelength. The mode, which is having the lowest cut-off frequency, is called the dominant mode. 17. What is the cut-off frequency for TEM wave? The cut-off frequency for TEM wave is zero. wave impedance for the TE1 mode. depth the wave has been attenuated to 1/e or approximately 37% of its original value. of magnetic field strength Hz in the same direction. component of electric field strength Ez in the same direction. between source and a matched load without altering the impedance relationship. 23. What is a principal wave? operating in their low frequency manner. It is usually called the principal wave. distributions, are known as degenerate modes. 25. What is a waveguide? used for propagating electromagnetic waves that are guided along the surfaces of the tube. 26. What are the basic types of propagating waves in a uniform waveguide? 27. Why rectangular waveguides are preferred over circular waveguide?  It does not maintain its polarization through the circular waveguide. 28. What is meant by the dominant mode of a waveguide? 29. What is known as evanescent mode in a rectangular waveguide? is known as evanescent mode. 30. What is the cut-off wavelength of the TE10 mode in a rectangular waveguide? Cut-off wavelength C = 2a. 31. 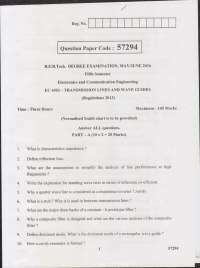 Explain the impossibility of TEM wave in waveguide. Suppose a TEM wave is assumed to exist within a hollow guide of any shape. Then lines of H must lie entirely in the transverse plane. Also in a nonmagnetic material, . the guide, the lines of H will be closed loops in plane perpendicular to the axis. 32. What are the applications of the waveguide? transmission. Circular waveguides are used as attenuators and phase shifters. determine the cut-off frequency for TE10 mode. 34. What are degenerate modes? (both m  0 and n  0) are always degenerate. 35. Mention the uses of circular waveguides. Circular waveguides are used as attenuators and phase shifters. field analysis inside the circular waveguide? 37.Which mode is the dominant mode in a circular waveguide? 38. Write down the expression for the cut-off frequency in a circular waveguide. TE01 mode propagation, calculate free space wavelength and cut-off wavelength. 40. Why is TM01 mode preferred to the TE01 mode in a circular waveguide? 41. What is the special significance of TE01 mode in a circular waveguide? decreasing with increase in frequency. 42. List the degenerate modes in a circular waveguide. 43. What is a microwave cavity resonator? the peak energies stored in the electric and magnetic fields are equal. 44. What are the parameters that determine the performance of a cavity resonator? Resonant Frequency, Quality factor and input impedance.